French: Todier de Cuba; German: Vielfarbentodi; Spanish: Barrancoli Cubano. 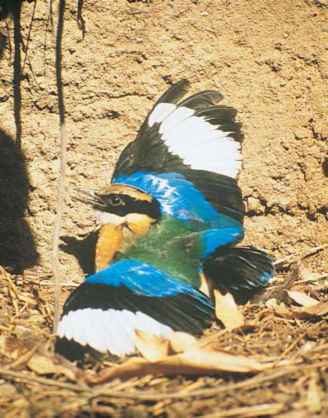 PHYSICAL CHARACTERISTICS 4.3 in (10.8 cm), wing chord 1.7 in (4.4 cm), estimated weight 0.21-0.23 oz (6-6.5 g). Most brilliantly colored tody, with smallest bill. Rosy flanks, yellow undertail coverts. Sky-blue cheek patch and wrists; yellow base of bill, whitish belly. Yellow-green, almost iridescent eyebrow. Cuba, including Isle of Pines (Isle of Youth) and larger cays off Cuba's north coast. Ecologically adaptable. Locally common in xeric (extremely dry), moist, and wet forests; mountains; and lowlands, especially in gullies. Only tody inhabiting shoreline vegetation. Highest elevation recorded 8,184 ft (2,494 m) (Sierra Maestra). Primarily insectivorous, plus spiders and lizards. Mean foraging height 9 ft (2.6 m) in arid scrub. Monogamous with striking courtship, exhibiting bright pink flanks. Smallest eggs in family. Breeds April to June. Excavates burrows in earth banks, rotten logs, natural limestone cavities, and (rarely) cave entrances. On Cayo Coco, uses sand at entrances of crab burrows. Not threatened. In 1970, common in protected Guantanamo Naval Base. Cuba's poverty and unstable economy may affect tody populations. 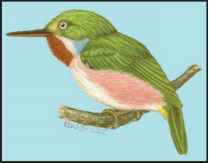 Recent pesticide use has reduced tody populations.